A kitchen exhaust system is an important part of any commercial or restaurant kitchen. For more than 35 years, when Fremont commercial kitchens have needed exhaust cleaning, they have turned to us AAA Fire Protection Services. We are the experts in fire protection and suppression, industrial fire systems, sprinkler systems, portable fire extinguishers and fire extinguisher cabinets. We offer a grease filter exchange program and periodic servicing and maintenance agreements. AAA Fire Protection Services cares about your safety! We are deeply committed to the protection of your kitchen employees which is why we provide the best industrial fire protection and suppression systems available. AAA Fire Protection Services is widely recognized as Fremont’s best provider of fire protection and suppression services. We were established in 1974 and we are still going strong! Our technicians are experienced experts in every aspect of fire protection and suppression. 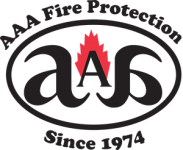 AAA Fire Protection Services is an independent family-owned company with strong roots in the community!